FES International, a global producer of fluid transfer solutions, has recently completed three successful initiatives in the Gulf of Mexico, including the supply of equipment to the Santa Cruz field, the Blind Faith 2 Project and to Technip for the Tahiti Vertical Extension (TVEX) project. 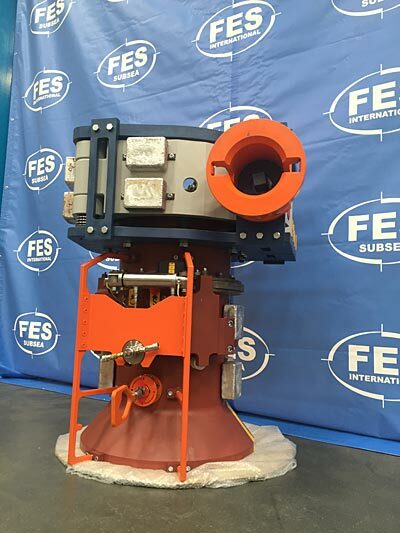 All called for the FES Diverless Bend Stiffener Connectors (DBSCs) technology, which has proved a big success for the firm, with over 370 connectors being successfully installed across 54 projects in various locations around the world in both shallow and deep water applications. The contract for the Santa Cruz field project was awarded by Aker Solutions and involved the supply of a DBSC semi-automatic male latch assembly which will be used by Deep Gulf Energy on the project. The FES range of DBSCs can be customised to suit specific client needs. For this project, the client’s requirements included a departure angle of three degrees into the DBSC and the provision of a locking device once the DBSC was engaged. Aker Solutions also awarded the contract for Blind Faith 2, which is the next phase of development for the Blind Faith field aimed at maximising oil recovery. It will deliver up to 17.4MM BOE net production through a combination of well work over new subsea architecture, skin remediation, and seafloor gas lift. The work by FES involved the design and fabrication of a bespoke Bend Stiffener Connector which will be used by Deep Gulf Energy on the project. This was soon followed by the supply of another DBSC for the TVEX project. Located in the deep-water US Gulf of Mexico, Tahiti is approximately 190 miles (306 km) south of New Orleans. It lies in Green Canyon blocks 596, 597, 640 and 641, in a water depth of approximately 4,200ft (1,280m). “Each project had its own unique challenges, which our technical engineers were able to overcome. For example, on the TVEX initiative, the Female half of the Bend Stiffener Connector was installed subsea without diver intervention. Our engineers provided a solution that incorporates a clamp allowing for ROV (remotely operated underwater vehicle) intervention to install the BSC Female subsea. We always work closely with our customers to ensure we provide bespoke solutions every time,” Anderson adds.